"A fast paced, action-packed thriller that transports the reader to pirate-ruled Somalia at the height of its violence, introduces realistic, fascinating and provocative characters, and ingeniously intertwines plotlines involving romance, good against evil, and international politics, all driven by the most potent motives of greed, fame, salvation, and survival. Highly recommended!" The Columbia Review. 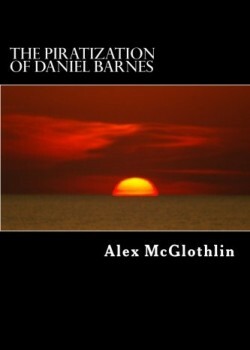 The Piratization of Daniel Barnes by Alex McGlothlin is a unique and timely novel that brings to life the actual inner-workings and innermost feelings of true-to-life Islamic radicals by taking the reader into the most turbulent peak of Somali pirate activities. In essence, the story centers on Daniel Barnes, a journalist arriving in Africa from Washington, DC in hopes of capturing a great, fame-worthy story, and instead ends up being captured by an infamous, glory-seeking Somali pirate. While the readers enjoy a secondary thread of a love story—after all, men always seek glory to impress, entice and earn the admiration of their love interest—the main thrust here is a violent yet psychologically intense thriller, with some elements of the Stockholm Syndrome (Daniel suffers, and then engages in, plenty of violent acts out of necessity and/or identification with his captors), and an exploration of the divide/overlap between Islamic faith and Islamic jihad. The pirate captain, Sayyid, makes for a fascinating villain, who seeks not only profits, but global fame. In making us feel complex emotions about such an evil antagonist and his bloodthirsty cohorts—we occasionally get close to admiring Sayyid!—debut author McGlothlin writes with a surprisingly mature pen. Barnes’s journey through the horrors of Mogadishu and its multiple power-holders of dubious moral and noxious ideological colors transforms not only him but also the reader. In summary, The Piratization of Daniel Barnes by Alex McGlothlin is a fast paced, action-packed thriller that transports the reader to pirate-ruled Somalia at the height of its violence, introduces realistic, fascinating and provocative characters, and ingeniously intertwines plotlines involving romance, good against evil, and international politics, all driven by the most potent motives of greed, fame, salvation, and survival. Highly recommended!